Manuel Pellegrini fielded a 4-2-3-1 as his Manchester City team’s basic shape. Two attacking wing backs, Aleksandar Kolarov & Pablo Zabaleta, flanked the two central defenders, Martin Demichelis and the heavily-criticized Nicolas Otamendi. 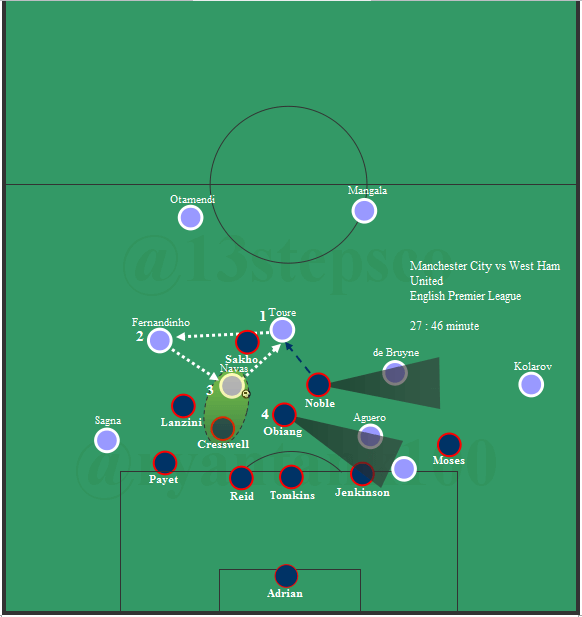 Fernandinho played as the deepest midfielder, and was paired with Yaya Toure, who moved across the 8 and 10. Alons with Silva & Sterling, these three often moved into the same halfspace or flank in order to create a situational overload to support ball progression. Claudio Ranieri utilised his narrow & compact 4-4-2/4-4-1-1 basic formation. Jamie Vardy & Shinji Okazaki were oriented to Manchester City’s two deep midfielders when Pellegrini’s team had possession. Vardy was tasked with staying close to Fernandinho, whilst Okazako was oriented to Yaya Toure. He would keep his distance to Toure, but not in a strict manner. Sometimes when Toure moved further forward (into the penalty area, for example) Okazaki held his position in a moderately advanced position. Manchester City basic attacking shape vs Leicester City narrow 4-4-1-1. City, as always, tried to play out from the back. In this first phase, the central defenders moved wide and Fernandinho dropped deep into the back line (salida lavolpiana). Okazaki would then press the ball-carrying central defender, and Vardy would stay central, man marking the deep-dropping Fernandinho. In the first phase of City’s build-up, the wing backs were often positioned too deep. This meant they were generally too close to the central defenders in early build-up. This provided easy pressing access for Leicester’s wide men, and allowed them to trap City at the touchline, forcing them to pass long or risk losing possession. The danger of such a situation was that Leicester often managed to claim the second ball through the energy of N’Golo Kante and aerial prowess of their defensive line. Once this happened, they would immediately transition into attack. In these situations, there was often huge space for Leicester to attack in Man City’s midfield. This gave the ball carrier more than enough time to release a killer pass directly to Vardy, utilising his acceleration & speed. Vardy was able to create some good chances from these situations. Riyad Mahrez’s goal also came from a similar process. Without the ball, Leicester operated with a fairly low block, and a focus on central compactness. They generally allowed City’s central defenders to have the ball, but instead tried to block any passing into the double pivot or other central players. By keeping the block narrow, this often forced City wide. Push them wide. The scene when City progressed to their second build-up phase. As previously mentioned, Okazaki & Vardy oriented to City’s double pivot, but this focus was not strict. In almost every situation where Toure moved forward, Okazaki allowed him to go without following. This was okay when defending in organisation and in a settled structure, but could have been an issue if Toure were able to impact the game more so. Space within Leicester’s low block. Fabian Delph moved forward, and Riyad Mahrez followed. This created space for Sterling. Kante spotted this, and immediately moved to close Sterling down. This gave Toure the chance to occupy the space that Kante vacated. The play was eventually foiled by good awareness from Danny Drinkwater. In the second phase of build-up, City were able to move the ball horizontally, with appropriate timing and speed. Combining this with Leicester’s narrow defensive shape created a ‘free player’ on the flank, deep in Leicester’s half. This may have created good opportunities for unlocking a stubborn defense. With a suitable player in this free role (not Fabian Delph), City may have been able to create more promising situations. City did not utilise this approach much. But through Leicester’s shape, they were naturally forced wide anyway. And City had poor structure to allow for the ball to progress into the centre of the field. For example, when Sterling moved wide to receive the ball, there was little presence between the flank and halfspace in order to allow for combination play. This simply isolated the wide player and created lots of block & wasted crosses. One attacking scheme that City have often utilised is penetrating through the halfspace. From the halfspace, City are attempting to gain access to the side areas of the penalty box. In many situations, as part of this penetration, there would be at least one player occupying the halfspace, acting as the connector for the one-two combination. City would ideally have the inward passes in an area closer to the danger zone, in order to generate more dangerous shots. But Leicester defended this zone very well. This meant many of City’s passes from the halfspace were actually away from goal. Unlike City, Leicester did not utilise attacking full-backs. In many ball progression situations, the ball would be played directly to the wingers or even Vardy, as Leicester attempted to attack City in transition. Their build-up play was generally focused on creating triangles, with the ball played into wide areas, before immediately passed into Okazaki or Vardy in the centre. With this direct passing style, Leicester generally attempted to counter through Vardy. In some situations, Vardy would stay wide when the ball was in Leicester’s half, and make a quick diagonal movement towards goal. In a quick attacking transition, Ranieri also licensed his twin 6s (Kante & Drinkwater) to roam forward. Both of these players were given license to dribble, or make off-ball movements forward in transition. But to ensure a stable base for any potential defensive transition, one of these two would stay deeper if the other moved forward. The loss against Leicester was yet another weak performance from Manchester City in defensive transition. But City are generally able to counteract this weakness through outstanding attacking penetration. This was not the case against Leicester, who focused on minimising the potential damage of halfspace passes, and forcing City into wide areas. Pellegrini may need to alter his approach in both attacking & defensive phases in the Premier League. But the continued weakness in defensive transition is a damning indictment of their hopes of reaching the latter stages of the Champions League. They have now lost three times at home; previously against Liverpool and West Ham. But their lack of compactness in transition (and also often organisation phases) has been a major reason for their lack of prior Champions League success. And it shows no sign of changing. Manchester City took on Stoke in a windy afternoon at the Britannia Stadium in what was a prime opportunity to move away from the pack in the race for the title. Stoke’s status as the Premier League’s archetypal tricky away game has perhaps been lessened with the move from Pulis-ball to a slicker passing style of play, but they remain a difficult matchup for every team in the league. Despite Tony Pulis operating in survival mode throughout his time at Stoke, Mark Hughes has truly consolidated Stoke’s position as one of the premium mid-table clubs in the Premier League. Both teams operated with their standard 4-2-3-1 formations, with Stoke clearly outperforming City and grabbing a deserved 2-0 win. There were a number of issues that Pellegrini’s team suffered that combined to make this a pretty comfortable day for Stoke. West Ham surprised us as they managed to beat Manchester City at City’s Etihad Stadium. Some said it was down to luck on Slaven Bilic’s side, as they saw City dominated the midfield and created a lot of promising chances. But, to some extent, to say it was all about luck would be unfair to West Ham. Especially in the first half, Bilic’s players performed some nice defensive actions with moments of individual brilliance. Let’s take a closer look at them. City lined up with a 4-2-3-1. An offensive formation, as many expected them to. Bacary Sagna & Alexandar Kolarov flanked the central defensive duo, Nicolas Otamendi & Eliaquim Mangala. Yaya Toure, the heart of City’s play, was paired with Fernandinho as the double-pivot at six; with Yaya, as ever, more adventurous than the Brazillian. Jesus Navas, Kevin de Bruyne, & Raheem Sterling were the attacking midfielders three behind the 9, Sergio Aguero. West Ham defensive-based strategy was based around a 4-1-4-1/4-2-3-1 basic formation. 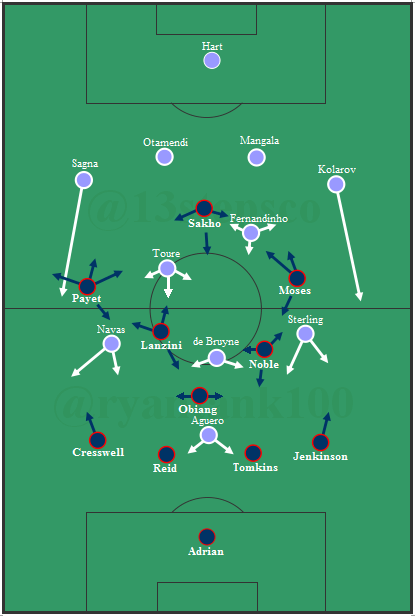 It was an assymetric approach, as Dimitri Payet and Victor Moses’ playing manner was different, with the former attacking the half-space and the wing, both deeper and upper field, and the latter was more of a wide forward who defended the right flank but attacked more centrally. Bilic did not opt to press with high intensity, instead opting to form a deep block, inviting City to come and attack them. It was vital that West Ham remained tight & narrow in this deep block, something they achieved well. They waited for City to get into the middle third before raising the pressing intensity by creating valuable overloads across their own half. Especially throughout the first half, West Ham pressed effectively and limited City’s penetration. For the most part, it was a case of West Ham’s good level of spatial compactness between the second line pressing and the cover behind it. One thing that made West Ham’s defensive play more interesting was that their zonal-marking was man-oriented. The first key was their ball-oriented shifting and the devoted six, Pedro Obiang. The positioning of Payet and Moses, on the left and right hand side respectively, was the first barrier for any City wide attack which enabled West Ham to create the first wave of wide-defensive-blockade. This effort of pushing City wide was triggered by the defensive-positioning of Sakho, as he was found occupying the area where City’s sixes were. From there, Sakho looked to be trying to nullify the working-space of any City’s sixes. The centre of West Ham defensive formation was also supported by their eight, who covered the half-space between the winger and the full back. In their man-oriented assignment, the wingers were oriented to City’s full back and the full-backs were oriented to City’s wingers, with the eights and six oriented to any City’s central players. These were the normal approaches in a man-oriented system. The upside of this approach was that West Ham were still able to maintain their compact defense, as they managed to interchange properly when necessary and kept the spare-man present. Pedro Obiang was the main who allowed their constant positional interchange. He secured the vertical six space, acted as the cover for the wide-area pressing, and filled the horizontal space between the wide men and the centrally ones. Obiang moved across the defense which in many occasions had helped West Ham to maintain their spare-man-plan within the man-oriented system. A pass from Yaya Toure reached de Bruyne on West Ham’s left half-space. De Bruyne made a short pass-combination with Sagna before the ball was passed to Navas. As the City’s right back moved centrally, Obiang took the duty of man-marking him. This positioning from Obiang assured West Ham to keep the stabilization of their defensive-compaction. Because it didn’t only cover the vacant space of Cresswell man-marking on Navas, but it also allowed Cresswell to maintain his tight marking on his assigned opponent. The other good side of this defensive scheme is that Cresswell’s man marking was supported by the smart cover from Payet and Lanzini, as they let de Bruyne unmarked on the half-space but still able to put de Bruyne behind their cover shadow. When Obiang man-marked Sagna, West Ham created a numerical superiority shape which giving them better defensive access. Unfortunately, this 3v1 pressing on Navas ended up with a foul-call as Cresswell fouled Navas. As discussed earlier, West Ham defended in a 4-1-4-1 basic formation. This shape allowed Obiang (as the six) to secure the vertical space between West Ham’s back and middle line. As the central player in this 4-1-4-1, Obiang on many occasions positioned himself well, as he blocked any possible diagonal pass which stopped City from progressing. Here is the sequence. In the 27th minute, along with Sakho, Obiang positioning allowed him to block Toure’s central passing lane that force the captain to play it square to Fernandinho (1). Fernandinho then found Navas on the right half-space (2). Under a man-mark of Cresswell, Navas moved to zone 5. Obiang position (4) blocked Navas passing lane to Aguero, which latter forced the Spanish to play it back (3) to Yaya Toure. Such scene occurred many times and made it very hard for City to make the ball progression they were hoping for. From his central position, Obiang was also able to shift from one half-space to the other half-space, either to make a pressing-cover or became the main-presser if necessary. Overall, West Ham players managed to occupy both half-spaces. This half-space occupation, in turn, not only had helped them to squeeze the space and establish compact defensive-shape, but it also gave them good access for a smooth counter-attack. Dimitri Payet was the player who often seen to be profiting from such strategically-benefit of half-space in regards of flexible attacking transition. The first West Ham’s goal was the perfect example. In the 04 : 15 minute, in the central area of zone 8, Obiang and Lanzini pressed Toure and forced Toure to missed his pass. The ball was recovered by Reid who passed it to Payet on the left half-space. Payet passed it back to Obiang who made a short-pass combination with Lanzini on the half-space. As the ball was circulated to the right side then back to the left half-space, Lanzini passed it forward to upper left half-space to Payet before the play maker made a pass leading to the Victor Moses’ goal. In the first half, you can find Payet occupied the half-spaces in many many occasions which helped him trigger many attacking situations. In the first half, Manchester City allowed too much space for Payet. This provided many good chances for Payet to shift between both half-spaces. The moment from 41st minute illustrated this well. Payet moved far to the West Ham’s right half-space in City’s defensive third. He occupied the half-space as he needed to create a triangle shape helping Jenkinson and Moses to make saver ball circulation. From here, Payet moved centrally, received the pass from Obiang before finally releasing a perfect through ball to Sakho. Dimitri Payet’s through pass to Sakho. West Ham’s second goal was also started by a Payet ball-recovery, as he intercepted Otamendi’s clearance. 23 seconds from Payet’s interception West Ham made a float cross, resulted a corner-kick which lead to the Sakho’s goal. Man. City 0-2 West Ham. Several changes were made by Man City in the second-half. The obvious adjustment was observed in their back-line set-up as Martin Demichelis came in replacing Equalim Mangala. The other adjustment of City, in the second half, was the outcome of Manuel Pellegrini decision as he realized he gave too much space for Payet. He instructed his central defender duo to man-mark both Sakho and Payet tighter than they had applied in the first half. Demichelis would come closer to man-mark Payet whenever the 10 got into City’s middle third. The other adjustment was the attacking movement. First on Yaya Toure, who Pellegrini asked to take a more aggressive approach. The captain was pushed further forward and occupied the 10 zone more than he did in the first half. The second, was the movement of Man City’s duo of wide-men. Navas and Sterling were shifting more to the central area throughout the second-half. By doing this, they tried to create valuable central overloads. This impacted positively to Man City’s chances creation. Man City created more promising chances that was reflected in their expected goals (xG) stat, as shown by Michael Caley. The freedom of attack given to Yaya Toure became the key factor of this. For the people who said Man City were so much unlucky, the second-half situation seemed to support their argument. 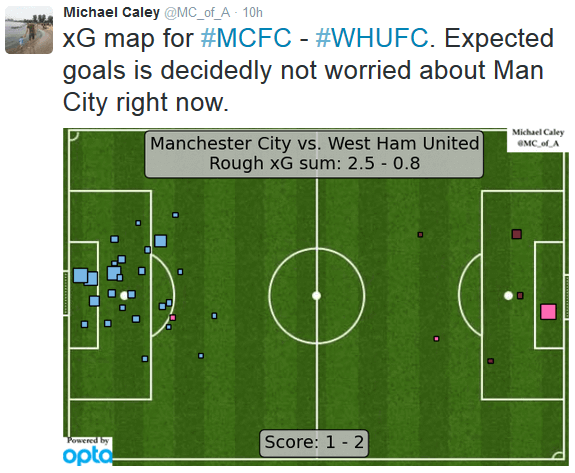 Michael Caley’s xG from Manchester City vs West Ham match. Defensively, West Ham managed to play the football they had planned before. Slaven Bilic’s boys established a plan that Manchester City found difficult to break down. They played their man-oriented zonal-marking properly as they didn’t lose the space easily. With their positional structure, West Ham could still “create” the spare-man within their man-oriented system. As the first half was a hard round for Man City, Manuel Pellegrini made some changes in the second-half which in turn, gave them better attacking access. City were more aggressive in terms of attacking positioning and created some promising chances. From west Ham, they deserve the credit for their resilient defensive play. If asked to mention who to be the man of the match, Pedro Obiang, Dimitri Payet, Yaya Toure, or Kevin de Bruyne deserve the recognition. The second round of Premier League fixtures saw the two top teams from 2014/15 face off, as Chelsea visited Manchester City’s Etihad Stadium. Jose Mourinho played down the importance of the match prior to the weekend, but the game would provide an interesting analysis opportunity for gauging the capabilities of both teams for the new season. Manchester City dominated the first half, and Chelsea were unable to control the game. Generally, Mourinho teams are able to control the game without the ball by forcing the opposition away from dangerous areas. But this time Chelsea’s midfield had several issues that created more problems elsewhere. Tuesday night saw a repeat of last season’s Champions League as Manchester City hosted Spanish giants Barcelona. Manuel Pellegrini opted for a surprising team selection, with James Milner playing in central midfield — a role he had last assumed in the FA Cup defeat to Middlesbrough. Luis Enrique went as expected, with Lionel Messi starting on the right of a 4-3-3. Barcelona were on top from the first whistle, creating a number of goal-scoring chances and City would’ve been pleased to be only two goals down at the break. They came back into the tie in the second half, but such a first half performance is unforgivable in elite European competition. A number of factors contributed towards such a disappointing performance. The area that City are particularly effective in is the wide areas inside the penalty areas. Even playing against teams with little room between their central defenders and full-backs, City are able to exploit the space.